I’m a few days behind on most of these, which is why you’re far better off bookmarking my good friend (and sometimes boss) Bill “Jett” Ramey at Batman on Film for all the news on The Dark Knight Rises. I recently posted a couple of interviews with Christian Bale (here and here) in which he shares his excitement for playing Batman again and says it’s his last time wearing the cape as far as he knows, but that it really depends on whether writer/director Christopher Nolan will come back to Gotham City after The Dark Knight Rises. Nearly every website on the planet was falling all over itself to misquote Bale and make it sound like he said he’d never play Batman again after his third go, when that’s not what he said at all. Oh, well. The press hasn’t exactly been good to the man these last few years. Nolan says Rises is “the last chapter of our Batman saga” and that he’s “super-excited” about “finishing our story in a very enthusiastic way.” This is all very good news. If I had my way, Nolan and Bale and their team would still be making Batman movies when Bale was 64, but all good things must come to an end, and it’s always best to go out on top. The amount of enthusiasm we’re hearing from both Nolan and Bale can only amount to good things for this last final movie. Unless, of course, Nolan changes his mind. It’s not likely given all the ideas floating around in his head that he’s bound to be itching to turn into films, but you never know. He also mentions the possibility of revisiting the world of Inception at some point, too, and talks about the solid possibility of a video game set in that world. At an awards season party last night for Inception, we asked the filmmaker about a report on a New Zealand website saying that Nolan and Warner Bros. were thinking of inserting unused footage of Ledger as the Joker into the movie. 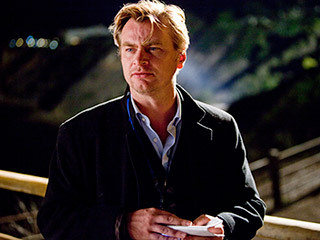 As with anything connected to Batman and Nolan, the rumor quickly spread around the globe. But Nolan and his wife/producing partner Emma Thomas both swatted down the rumor to Heat Vision in a chat last night. Nolan also denied that Ledger would show up in the new film. The script isn’t even completed yet, he said, and Nolan believes that Ledger’s performance as the Joker should be contained to the 2008 movie. He’s only had to say that about a dozen times now. Hopefully that will be the last. Moreover, he also finds it hard to believe so many fans think he’s written, cast, shot and finished his films before he’s even started. In particular, “The Dark Knight Rises” at the moment, where he’s still just finishing the screenplay and hasn’t finished casting at all. And make it clear Batman fans, this wasn’t Nolan just being humble for the sake of the press, he really thinks you all might be giving him just a bit too much credit. His films come together during the production and editing process and he’s certainly not thinking of what he’ll do after “Rises.” That’s the furthest thing from his admittedly one track mind at the moment. Lastly, I joked with Nolan about his Batman muse Christian Bale who told the press recently he doesn’t believe anything about future “Dark Knight” movies until it comes out his director’s mouth. Nolan sadly hasn’t gotten a chance to see Bale’s amazing turn in “The Fighter” yet, but he did reveal he keeps Bale pretty up to date with what’s going on. So, perhaps it’s Bale that’s being decidedly mum? Nolan penned the script with his brother, Jonathan, who co-wrote The Dark Knight with him from a story crafted by Nolan and David S. Goyer (who also co-wrote Batman Begins and most recently collaborated with Nolan again on the upcoming Superman movie directed by Zack Snyder). But in the real world, this goal proved elusive. Nolan, bearded and affable, explained that he’s scrambling to finish the script for The Dark Knight Rises, his third Batman movie, which he’s writing in collaboration with his brother Jonathan, mostly from his oceanfront abode in Malibu. The script is due in January for a July release. But he wouldn’t say what the story’s about or who the villain is, other than to confirm that Inception’s Tom Hardy will play “a key role, not saying good or bad,” and to shoot down reports that he’ll resurrect The Joker by including unused footage of Heath Ledger’s performance in the previous chapter. “That’s all wrong,” said the writer-director, who’s also producing the next Superman movie, for Zack Snyder to direct. Finally, there comes word that the script has now been turned in to Warner Bros.
Chris Nolan told me his The Dark Knight Rises script is due Monday or he’s in big trouble. Big trouble? What can they do? Fire him? Pre-production is said to begin in March with filming commencing in May. The full mysteries of The Dark Knight Rises won’t be revealed until July 20, 2012, but keep your eyes on Batman on Film for all the best news until then. No one will give you the same levels of enthusiasm and integrity you’ll get from Bill and his team. Which I still can’t believe includes me.